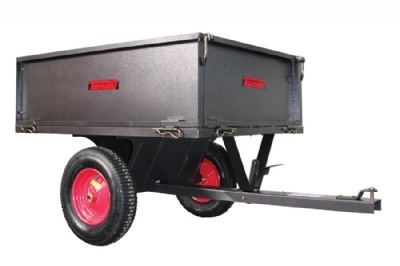 An ideal tipping trailer suitable for all lawn tractor brands. Tondu's TSC500 is a great solution for transporting sand, gravel and dirt, while the removable sides and tailgate mean that it can be simply converted into a flat-bed trailer. It has a capacity of 500 lbs, is constructed of steel and has a bed that measures 148 cm x 79 cm x 68 cm. Pneumatic 13" tyres ensure smooth control even over difficult terrain.